With our electric field calculator, you can compute the magnitude of an electric field created at a specific distance from a single charge point. In the text below, we will first try to answer the simple question: what is an electric field? Then, we will present the electric field equation for a point charge, and we will describe other possible sources of an electric field. An electric field is a field that exerts force on charges - attracting or repelling them. Moreover, every single charge generates its own electric field. That's why, for example, two electrons with the elementary charge e = 1.6 * 10^(-19) C, repel each other. You can check our Coulomb's law calculator if you want to quantify the amount of electric force between two charged particles. You probably know that everything in nature is made of atoms, which consist of a nucleus (positive charge) and electrons orbiting around the nucleus (negative charge). The nucleus generates an electric field which attracts and holds electrons on their orbits just like the sun and planets around it. k is the Coulomb's constant k = 1/(4 * π * ɛ0) = 8.9876 * 10^9 N * m² / C². 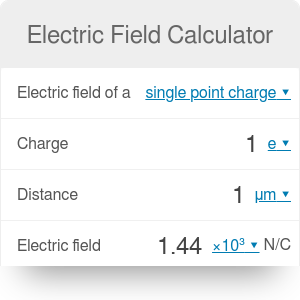 You can check with our electric field calculator that the magnitude of the electric field decreases rapidly as the distance from the charge point increases. An interesting fact is how extremely fast electrons accelerate in the electric field. You can learn more about it from the acceleration in the electric field calculator. A magnetic field that varies in time produces an electric field (and thus electricity - check our Faraday's law calculator). Both electric and magnetic fields store energy. We have written more about it in our energy density of fields calculator. You should check it out too! Electric Field Calculator can be embedded on your website to enrich the content you wrote and make it easier for your visitors to understand your message.